From this list, it is difficult to see that any special kind of design or feature is more popular than another. The most downloaded template in total is still andreas01, the template with the least number of downloads is the green version of andreas07. I used your basic template at http://www.anysubjects.com – The reason why I am so pleased you could help was I needed a template which would work well on an Amazon Kindle. You are now credited on each page of the very first ever website for Kindles, which only list websites someone with a Kindle can see without changing any of their font or screen settings, and so I want to say a huge thank you for all you have done to help! Please could you put a link from your site back to me, so others wanting to make Kindle websites, an entirely new concept, will get some more ideas about how to do it. Thanks again – without your amazing template, I would have been lost. Thank you. Glad I stumbled on this. I’m an engineer and part-time internet/network marketer who’s slowly becomming addicted to blogs – setting up and running. It’s a constant struggle to find quality templates – there are zillions out there, but so many look good but are junk to work with. Just what I was looking for – the best of quality templates. thanks. I agree, there is so much choice of templates that it is hard to filter out the average ones (to be polite) from the good ones. I’ve really kind of settled into Flexibility 3 – there’s just so many options is can do anything I ask. Thank you for providing your staff is really good. I am a web developer and needed a blog to my main website to inform visitors about updates to it and creating articles related to it. Downloading files and installing the same, very easily done in just 5 minutes after creating the database mysql. The Spanish translation is quite good, although I had to add the translation of some parts that were not translated from English into Spanish. Hi Andreas, I came across your templates from I template pack that I downloaded from somewhere now forgotten. This was in mid 2009, I wanted a WordPress blog and at that time I had never developed a website. 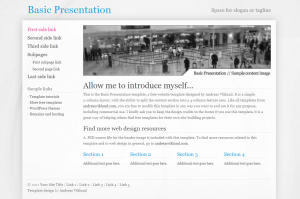 I choose the Andreas04 version 1.5 template for both the site and the blog. I had to do some hacking and thus learn html and css quickly to adapt the template for my needs. Now a couple of years later I can develop websites and code php. However I like the Andreas04 design so much that I just cannot bring myself to replace it. Thanks for the inspiration, reversing your templates taught me a great deal. Out of appreciation, I have fully credited and link back to you from my site. Thanks again Andreas and good luck to you.